“If the crime had been committed by a common man, the police by now would have arrested everyone, including the father of the accused,” said Vishnupuram, one of the organisers of the protest. Is the Kerala police going slow on the investigation into Sanal Kumar’s death? 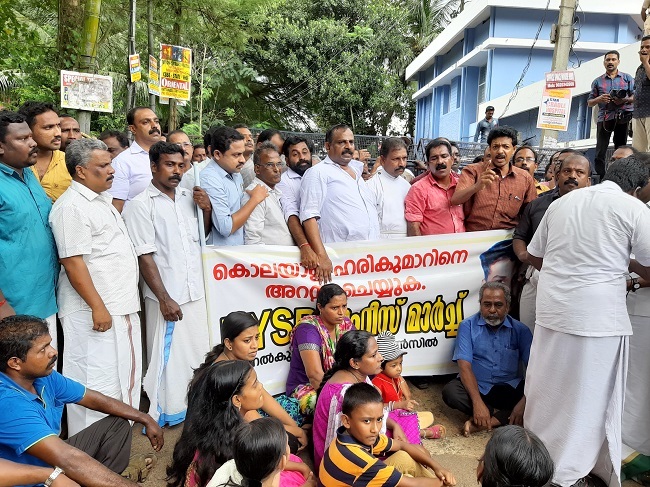 On Friday, despite the dark clouds and the drizzle, the people of Neyyattinkara lead by the Sanal Kumar Action Council took to the streets to show their anger against the inaction of the Kerala police in the case. Four days after 32-year-old Sanal Kumar died after he was mowed down by an approaching vehicle during an altercation with a policeman, B Harikumar, who was allegedly responsible for Sanal’s death, has not yet been arrested. Following prayers for Sanal at his house in Kodangavila at 10.30 am on Friday, around 100 people went on a protest march from Sanal’s house to the DySP office in Neyyattinkara. While marching, the protestors shouted slogans against the police and also shouted slogans demanding the immediate arrest of Harikumar. Heavy security and barricades were in place in front of the police station to block the protesters from entering the station premises. Harikumar allegedly pushed Sanal Kumar onto the road during an altercation over a parking spot, because of which Sanal was hit by the car. The protesters demanded the arrest of Harikumar at the earliest, and accused the police of dragging their feet in the case. “If the crime had been committed by a common man, the police by now would have arrested everyone, including the father of the accused, his wife and sister and so on. But the police have not yet raided the houses of the DySP’s family,” lashed out Vishnupuram Chandrasekharan, State President of the Kerala Kamaraj Congress as well as the president of the Sanal Kumar Action Council. The action council consists of local members of various political parties. “During the last four to five days, the investigation officer of the case has been changed three times. First we heard that P Ashok Kumar, the District Police Chief of Thiruvananthapuram Rural, was in charge of the case. Then we came to know that the case is being handed over to the Nedumangad ASP, and now we are told that the Crime Branch is handling the case,” said Vishnupuram. He went on to say that all of this is a part of a larger plan to delay the arrest of DySP, who is the main accused in the case. S Rajendran, a CPI(M) area committee member of Athiyannoor, who is also part of the action council said, “Neyyattinkara MLA, K Ansalan had met Chief Minister Pinarayi Vijayan regarding this case and the CM has very clearly given orders to begin a thorough investigation in this probe. Following this, the DySP was suspended, his bank account was freezed and his passport was also seized,” adding that it’s deeply disturbing that the accused has not yet been arrested. When the action council was formed, they had said that they will be working for three demands. One of them is to request the government to give a job for Sanal Kumar’s wife, Viji, who is now the sole breadwinner of the family. Second demand was to give compensation for the family. And the third demand was to select a senior IPS officer to probe the case.